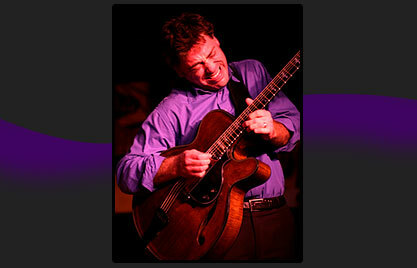 Born September 3rd, 1967 in New York City, guitarist Peter Bernstein has been a part of the jazz scene in New York and abroad since 1989. During that time he has participated in over 60 recordings and numerous festival, concert and club performances with musicians from all generations. As a leader, Peter has made five recordings for the Criss Cross Jazz label. The latest, Heart’s Content, features the all-star rhythm section of Brad Mehldau, Larry Grenadier, and Bill Stewart. Peter has also played with legendary drummer Jimmy Cobb (Cobb’s Mob), organist Larry Goldings, Dr. Lonnie Smith, Melvin Rhyne, drummer Bill Stewart, Joshua Redman, Diana Krall, Nicholas Payton, Lee Konitz, Tom Harrell, and Eric Alexander and performed in North America, Europe and Asia and making numerous television appearances. Peter has taught at the Julliard School, Berklee College of Music, North Texas State University, the New School Jazz Program and the Jazz Conservatory in Amsterdam. Peter has been fortunate to gain the respect of his peers and mentors. He has been recognized in both the readers’ and critics’ polls in Downbeat Magazine for the past three years. He continues to hone his style through writing and performing and has developed a distinctive and unforgettable guitar voice that is all his own.